The first high-resolution images of Jupiter are still several weeks away, but NASA’s Juno Spacecraft did capture this new image as it entered orbit around the planet. 1 Comment on "First In-orbit View from NASA’s Juno Spacecraft"
Well! 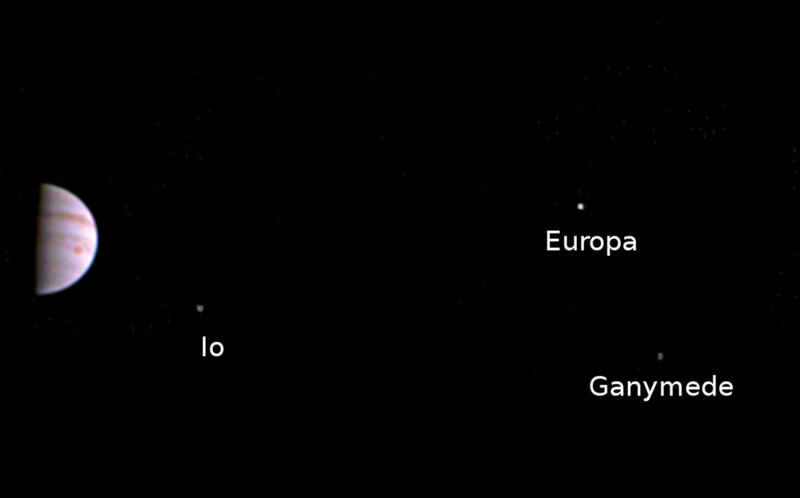 Juno spacecraft has come to Jupiter. It will dig out details about Jupiter’s floor whether it is solid or liquid. Jupiter is a failed star as we know. Hence the planet chemistry should be that of Sun which failed to burn through. Before cooling off the planet should give out lot of gases both in the atmosphere and from its bosom also. The formation of gases from Hydrogen should follow the periodic table,(H,He),Li,Be,B,(C,N,O),F,Ne,Na,Mg,Al,(Si,P,S) Cl.Ar,K.Ca…depending on their reactive nature with other compounds when nucleo-synthesis is taking place. The abundance of gases in this hierarchy should be from H,C,N,O namely CO2,N2,O2, CH4(Methane) ,NO etc and from the heavier terrestrial materials Si (Silicon) which forms most of the planets’ surface and Highly reactive P and S which combines with Oxygen to give H2S, SO2 , Phosphene gas etc which gives color to the atmosphere. If the planet has sufficiently cooled of silicon di oxide terrain would have been formed . Still volcanoes would spew up Sulphur di oxide and Phosphene in the atmosphere. This is precisely the reason for the red stripes on the planet. The white stripes show that they are ammonia in circulation. Laws of Physics say that if you go up in the atmosphere the cooling will take place automatically even if the terrain is hot. Hence it is extremely cold in the troposphere and very hot in the terrain, probably liquid or even solid with volcanoes erupting. Jupiter is a giant planet and it revolves in 11 hours and the atmosphere around it should also circulate in extreme high speed, pulled by its gravity. This gives straight bands and red belts on it. The great red spot is due to the cyclone and anticyclone activity as a reaction which lasts for centuries . All the small white circles represent only cyclones with no ground to react to the cyclone and neutralize. All giant planets are gas giants which also keeps a ring of gases around them besides multiple satelites like Saturn. Jupiter, Uranus and Neptune also are in the same category. In Uranus and Neptune the ground has already cooled off and we don.t know about very big giants Saturn and this Jupiter. Let Juno bring out all the facts to the extent possible before it dies off during the plunge finally which is inevitable. Thank You.